You will LOVE the bold flavors in this Pork Chili Verde! Cubed pieces of pork loin are simmered until super tender and then added to a delicious homemade verde sauce – SO good! Plus my recap from the Pass the Pork Tour in Michigan! Before I get to this amazing Pork Chili Verde recipe, I have to tell you about something exciting… I recently had the opportunity to visit Michigan for the very first time! I was invited by the National Pork Board to tour some pig farms for the Pass the Pork 2.0 Tour. Now, this isn’t my first rodeo, as it pertains to pig farms. I was invited to Iowa back in 2015 to the first Pass the Pork Tour. That was a really fun trip so I was excited to visit more pig farms. As a food blogger, I feel the need to learn all I can about different kinds of foods and developing new recipes, but also about where our food is coming from and how it’s being raised & farmed. It’s my job to learn these things so I can relay the information back to you, the readers. Makes sense, right? Since I’d been to the Brenneman’s farm in Iowa a few years back and I learned a ton on that trip, I thought I knew everything pig related. NOPE! Stepping foot on these Michigan pig farms, I learned so much more about the care taken for these animals by these amazing farmers. On this trip, we learned information on all the different cuts of pork, tasted new pork recipes and also learned new ways to cook pork. We also learned about pig safety and why certain things are implemented at these outstanding farms. Pigs used to be raised outdoors which left them vulnerable to the weather, illness and many other variables depending on their location. Farmers can now bring the pigs indoors and can control the environment to raise healthier pigs. They use filtration systems and hepa filters to filter the air to reduce infection, illness and disease from getting into the pig barns. They also use air conditioning and heat to keep the pigs nice and comfortable when the seasons change. The ability to keep the pigs indoors instead of outdoors means healthier pigs and less pig fatalities. This also means the pigs are not rooting around in the dirt and are not exposed to something called Trichinella. Trichinella is a parasite found in the dirt, and the trichinosis could be passed onto humans if it wasn’t killed in the cooking process. With all the changes in biosecurity and with pigs being raised indoors, this is not a risk anymore. You guys, this is huge news! Because of trichinosis not being an issue anymore, the pork industry has changed the recommended cooking temperature to 145º F with a three second rest! This means no more dried out, tough pork! Check out the chart below to see the new pork recommended cooking temps. 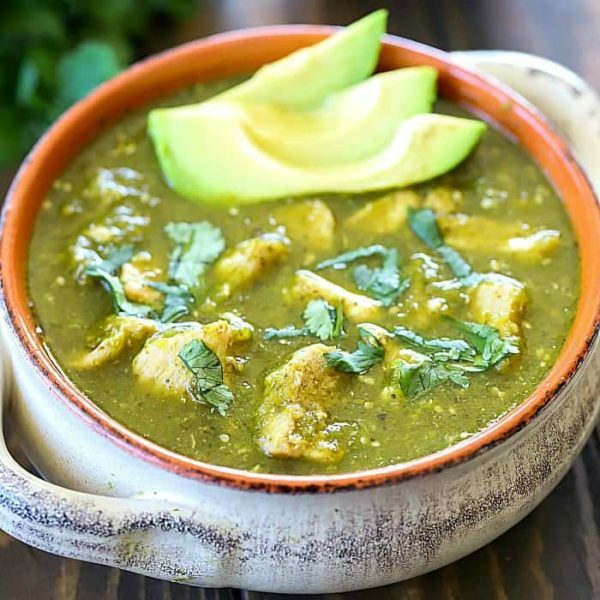 The pork industry is constantly improving to take the best care of their animals, and in return, giving us the best quality pork.All this being said, I want to share an amazing recipe with you – Pork Chili Verde! In case you didn’t know, verde means green in Spanish, hence the bright green sauce in this Pork Chili Verde. I have lots of pork recipes here on this site, but this has got to be one of my very favorites. I love a good verde sauce. There’s something about the combination of peppers and tomatillos that my palate just loves! There’s a Mexican restaurant that I love going to and ordering their chili verde. But homemade is always better and cheaper, right?! Some recipes will tell you to roast the peppers ahead of time and then peel and blend in a food processor or blender. You get to skip that step in this Chili Verde recipe, which makes it super easy. You blend all the peppers and tomatillos together and then simmer the mixture in a saucepan to get the roasted flavors. It’s to die for! One of the things I love best about this Chili Verde Recipe is you don’t have to sit and babysit it. You brown the pork and let it simmer for 2-3 hours to get the pork super tender. The chili verde sauce is easy to throw together and has a nice kick to it. Once the pork and the chili verde are combined, this is a delicious meal the whole family will love. Top with your favorite garnishes, such as avocado, cilantro, sour cream, etc. or serve with tortillas and beans. Either way, this is a delicious comfort food dinner! Cubed pieces of pork loin are simmered until super tender and then added to a delicious homemade verde sauce – SO good! Heat a cast iron skillet over medium-high heat. Pour in olive oil and add cubed pork loin. Brown, stirring occasionally. When pork is browned on all sides, carefully take pork out and set aside. Do not drain the liquid from the pork. Add in shallot and stir until soft, then add the garlic and stir until fragrant. Place the pork back into the pan and add in chicken broth. Meanwhile in a blender, combine peppers, jalapeños, tomatillos, cilantro, oregano, cumin and salt and pepper and blend until smooth. Add additional water or chicken broth if it’s too thick to blend. Spray a saucepan with cooking spray and add the green salsa from the blender. Simmer on medium heat until it becomes a deep green, for about 8 minutes, stirring occasionally. Add the green salsa to the tender pork and stir together. Cook for about 30 minutes, or more until the chili verde is heated through and flavors meld together. Taste and add any extra seasonings. Serve in bowls and add any desired garnishes. Enjoy! The post Pork Chili Verde Recipe + Pass the Pork Recap appeared first on Yummy Healthy Easy.